SKU: PQA09. Categories: Party & Event, Serving Equipment, Glassware. Tags: barware, beer glass, glassware, pilsner. A beer pilsner is simply a classier way to drink beer. 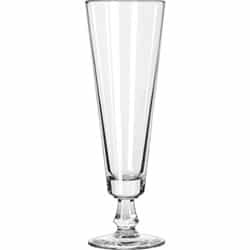 All glassware comes to you clean and ready to use and does not even need to be cleaned before return! This is a 4′ wide, black formica portable bar with a shelf. The top piece comes off and the bar itself collapses for easy transportation. Great for any event where you need a bar setup. This is a 6′ wide, black formica covered portable bar with a shelf. This portable bar includes a black or white skirt to cover the front. The top piece comes off and the base itself collapses for easy transportation. Great for any event where you need a bar setup.